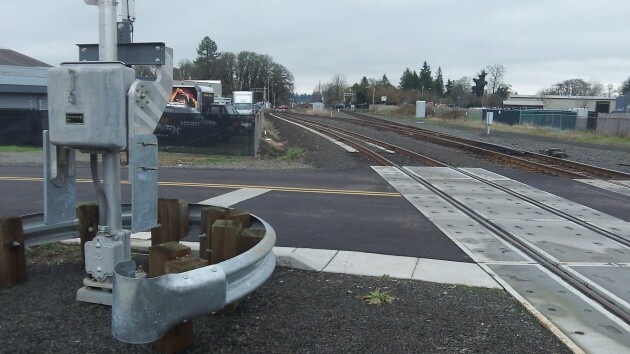 Last week, somebody went across the lowered gates at an Albany railroad crossing and lost his life, and people were shaking their heads why anyone would ignore all the warnings at grade crossings. And then I came across this today: Gates, flashing lights and bells being activated at the Main Street crossing without a train anywhere in sight. Going north on Main, I had just crossed the tracks on my bike when the lights started flashing, the bells went off and the gates came down. Cars stopped, of course, as they should, on both sides of the crossing. I had not seen a train approaching from either direction, so I turned around to see what was going on. Everything back to normal after an unexplained activation of crossing gates at Main Street Tuesday afternoon. What about that 800 800 number? Is it legit? I’ve seen the same thing many times over the years. Even scarier, a couple years ago at the Scravel Hill/Jefferson intersection, a train was coming, but no lights or bells went off, and the arms remained upright. Don’t rely on those things. I live right near the main line in Albany. There are people still walking the tracks and occasionally they hit the area that sets off the guards and lights.